This blog recipe post is an adaptation of the mini cherry cheesecakes that we featured on April 23 for National Cherry Cheesecake Day. In this version, instead of topping the mini cheesecakes with canned blueberry pie filling, the drained blueberries are sandwiched between layers of cheesecake batter. 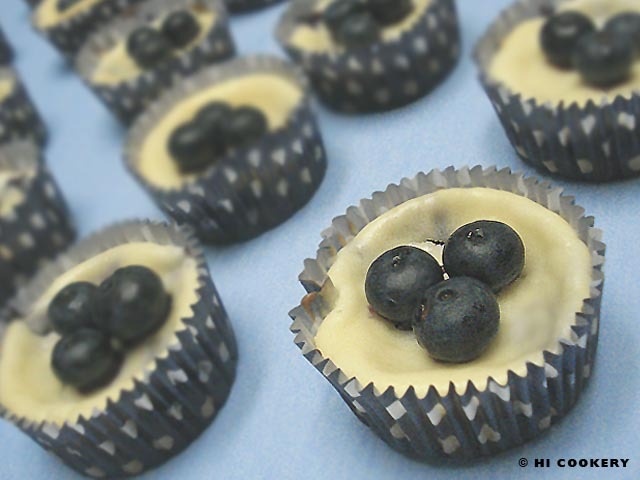 Fresh blueberries enhance the taste as well as the presentation of these mini blueberry cheesecakes. The double dose of canned and fresh blueberries is a “berry” good combination for National Blueberry Cheesecake Day. 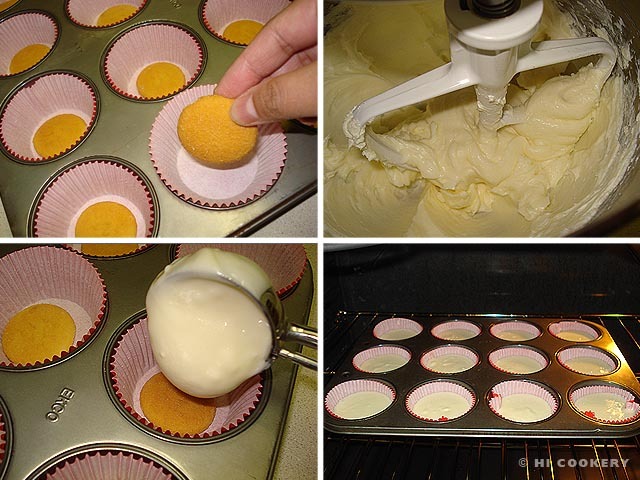 Line a muffin tin with cupcake papers and place one vanilla wafer in each cup. Drain the can of blueberry pie filling in a colander, separating the berries from the thickened liquid; reserve the liquid. Beat the cream cheese, sugar, vanilla and eggs until smooth. Cover the vanilla wafers with a small amount of cheesecake batter. Add a teaspoonful of drained blueberry pie filling on top of the first layer of cheesecake batter. Cover the top of the pie filling with a second layer of cheesecake batter, being careful not to mix the colors, about 2/3 full. Tap the bottom of the muffin tin until the batter lies smoothly. 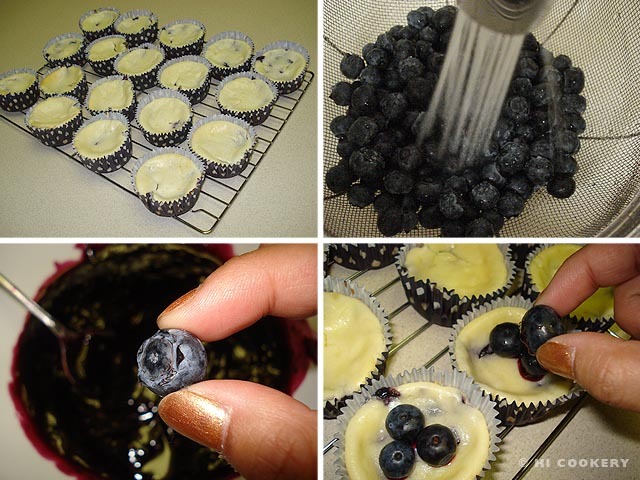 Bake the mini cheesecakes in a preheated oven at 350 degrees F for 25-30 minutes. 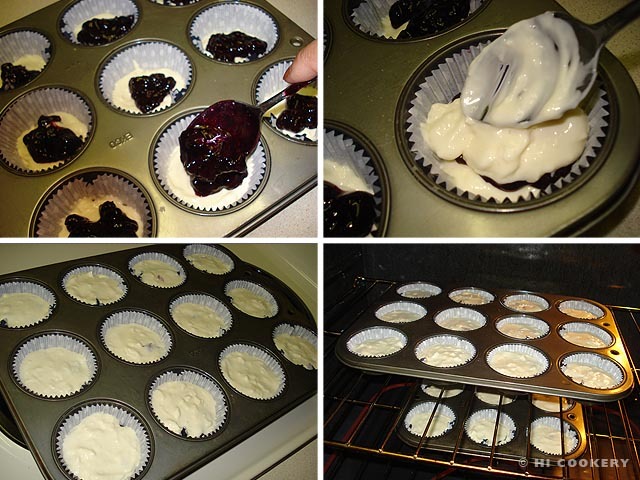 Remove the mini cheesecakes from the oven and let stand for 10 minutes in the muffin tins. Transfer the mini cheesecakes to a wire rack to cool completely. Refrigerate for at least one hour to set. Rinse and dry the fresh blueberries. Dip a blueberry in the reserved liquid drained from the canned pie filling and stick it the middle of the cheesecake well. Repeat with two more blueberries and arrange the decoration on top. Refrigerate until ready to serve. Yield: About 1 ½ dozen. College is not just a place to learn for a career but also about cooking. 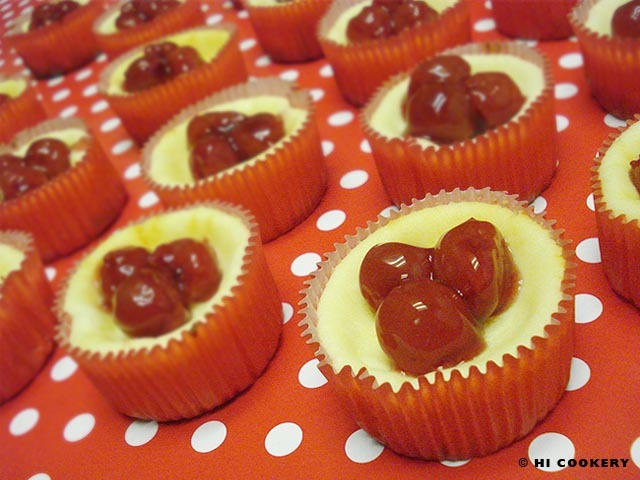 Islander first learned how to make mini cherry cheesecakes from someone in one of her classes. Then she shared the recipe with her roommate, Monica C., and they baked them together in the dorm kitchen. They were a luxurious and delicious dessert compared to the cheap cardboard-tasting pizza and five-packs-for-a-dollar instant noodles they often ate as students. 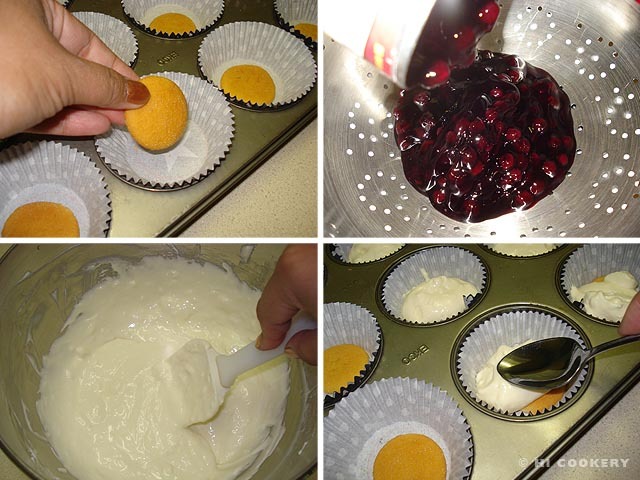 Islander continues to make mini cherry cheesecakes for college kids as part of her involvement in campus ministry. 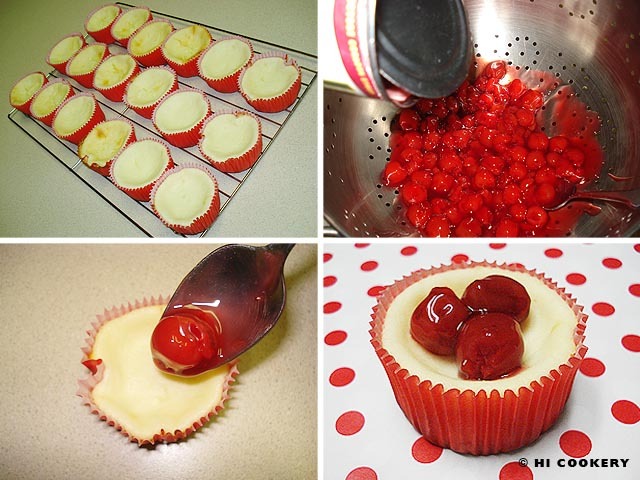 These snack-sized sweets are our featured blog recipe post for National Cherry Cheesecake Day. Line a muffin tin with cupcake papers and place one vanilla wafer in each cup. Beat the cream cheese, sugar, eggs and vanilla until smooth. Pour the batter 2/3 full in each cup. Bake the mini cheesecakes in a preheated oven at 350 degrees F for 20-25 minutes. Remove from the oven, let stand for 10 minutes in the muffin tins. Then transfer the mini cheesecakes to a wire rack to cool completely. Drain the cherry pie filling in a colander. Place three cherries in the middle of the “well” of the mini-cheesecakes. Chill for at least half an hour before serving. Yield: About two dozen. Change the cherry pie topping to blueberry and serve these cheesecake cups on May 26, National Blueberry Cheesecake Day. Search our blog for more posts on cheesecake recipes.